Ananka's Diary: Why Are They Laughing? Perhaps because the oldest human hairs were recently discovered . . . inside a pile of hyena dung. Scientists estimate the hairs to be around 200,000 years old. Read more here. Thanks for the tip, Big K.
haha...i like the cute animal link for the faint hearted! Woah, that's CRAZY!!! 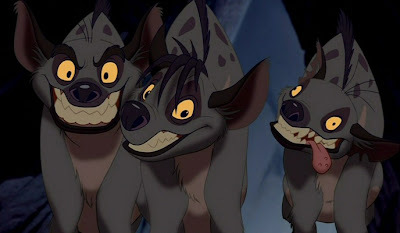 Hyenas ate humans?!?! I like the baby animal pics too! Wow. Just what I wanted to hear. My ancestors were eaten by hyenas. The argument stands! This is disgusting. "No king! No king! Lalala Lala La!"